Wednesday February 1st. Walsden to Mytholmroyd. 14 miles from Walsden. Leader Mike Lee. 19 walkers and 1 dog. 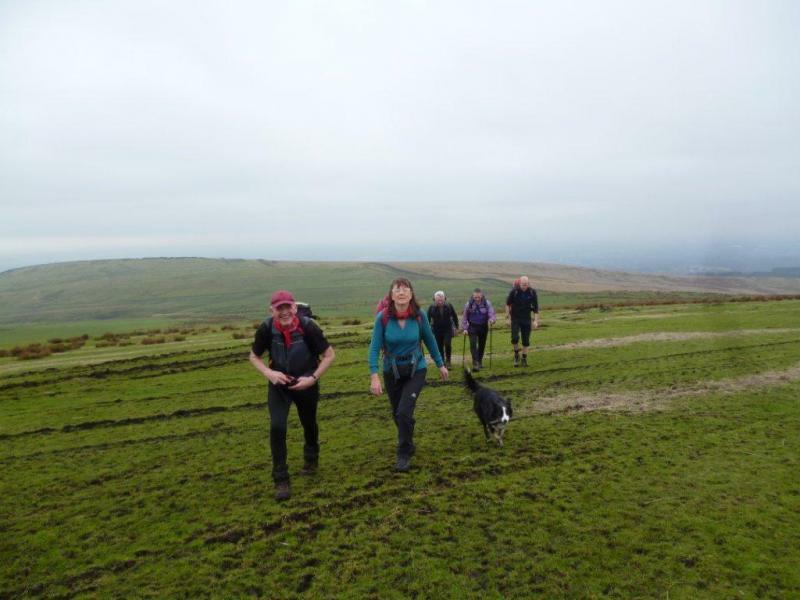 We were pleased to welcome three new faces, as well as some old ones, to the group of nineteen people and one dog who met in Walsden to trek the wintry moors above Calderdale. 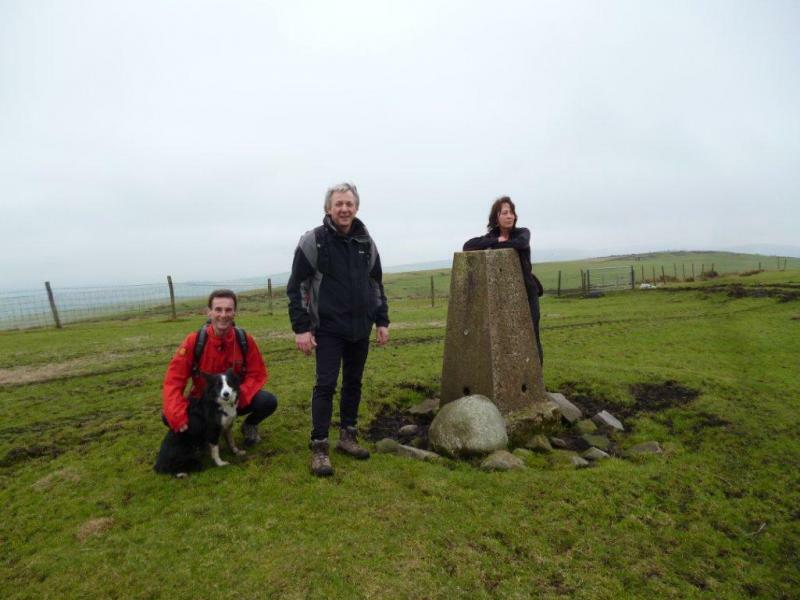 The walk started with a warm-up climb out of Walsden up to the Basin Stone and then to Gaddings Dam. The sun was shining and we had extensive views over Walsden to the Rossendale hills beyond, but the biting easterly wind made it a place not to linger. 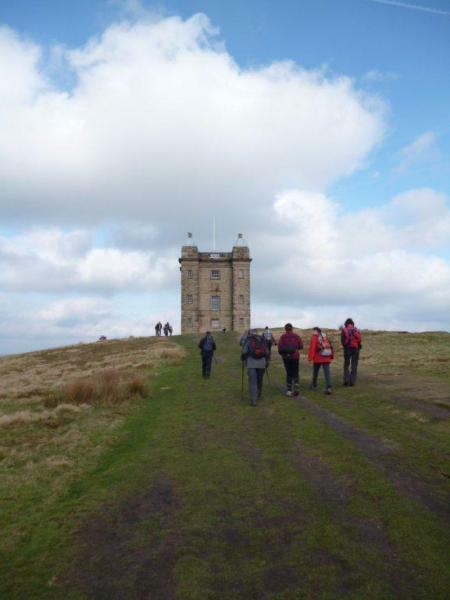 Quickly leaving the dam, we continued on a path along the edge of the moor top, at times treacherously icy but with spectacular views out over Lumbutts and Todmorden, until we reached the Pennine Way path and Withens Gate. After a brief stop we descended to Withens Clough Reservoir and then followed the contours along the line of an aqueduct to look down on Cragg Vale village in the valley far below us. A short climb then took us past Higher House and a descent into Trimming Dale. We crossed Trimming Dale and followed old lanes over the moor top until we could look down into Calderdale. Again, the views out over Calderdale and beyond were spectacular, but the walls on the moor top had given us little shelter from the icy wind and we willingly descended to the relative warmth of the valley bottom at Luddenden Foot. From there we followed the canal and Calderdale Cycleway up the valley to Mytholmroyd, arriving with half an hour to wait for the train back to Walsden. 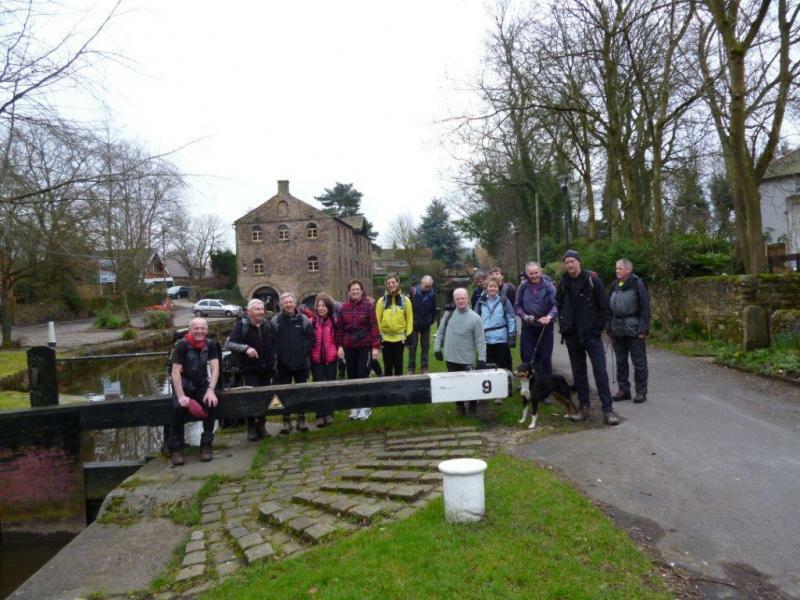 Most of us headed for the pub, but two of our number decided to walk the further mile or so to Hebden Bridge. It then only remained to take a short train ride back to Walsden to complete the circuit. Points were lost for something or other, but it didn’t seem to stop people enjoying the walk. Wednesday February 15th. Thirty Six Degrees Part 2. 13 miles from Burscough. Leader: John Pickton. Stage Two of Mr Pickton’s “mystery tour” and we are no nearer knowing where our final destination may be! 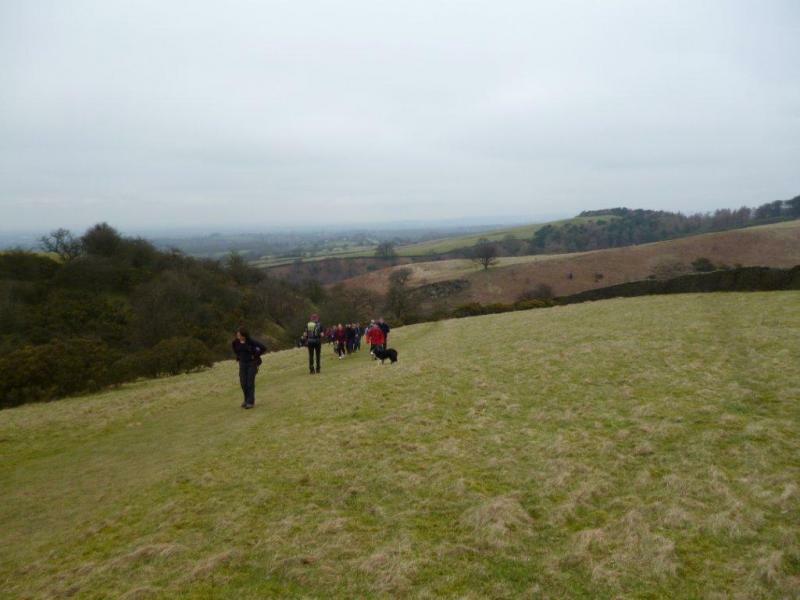 It was however another thoroughly enjoyable and well thought out walk. 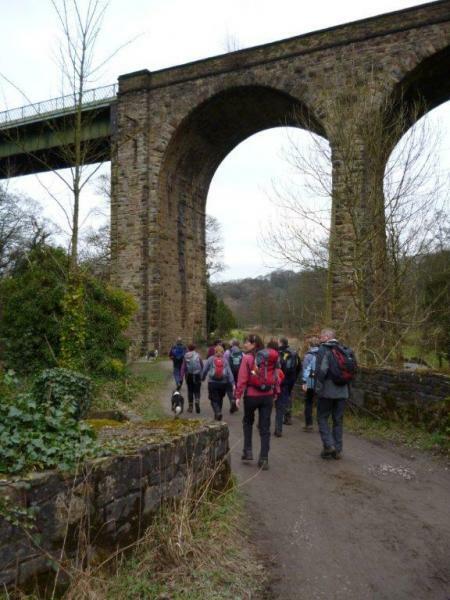 We had the pleasure of the company of three “debutantes”, schoolteachers Rebecca and Tracy, who are studying for their Walk Leaders badges so they can help run the Duke of Edinburgh Scheme for their school Parklands in Chorley, and ten year old Hannah, John P’s lovely granddaughter. Meeting at John’s house at Adlington we travelled by luxury Tyrer’s coach to our start at Burscough. 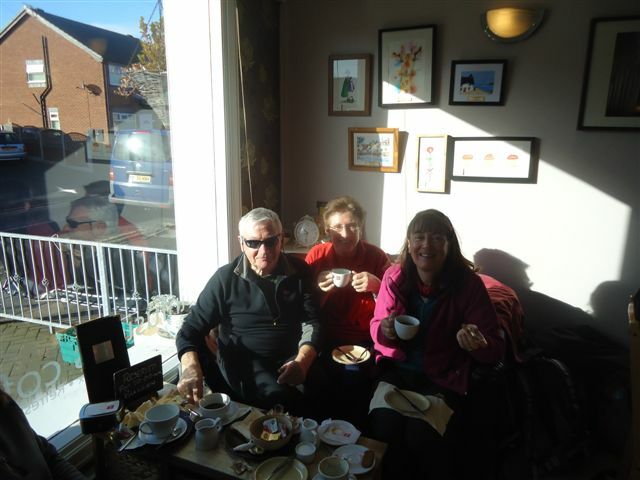 As pre-arranged we had tea or coffee and toast at Infusions Café where owner Craig and his two waitresses did us proud. 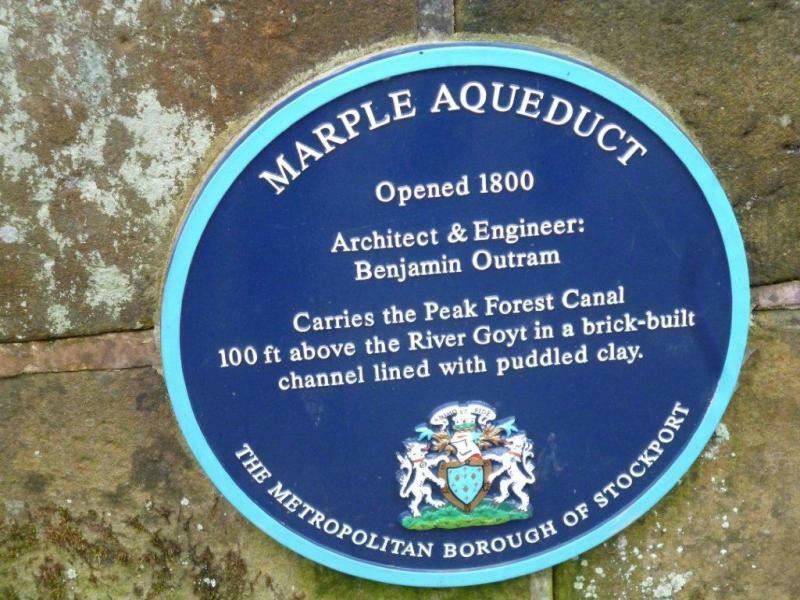 We were soon on our way down the Leeds/Liverpool Canal and then onto the Rufford Link. 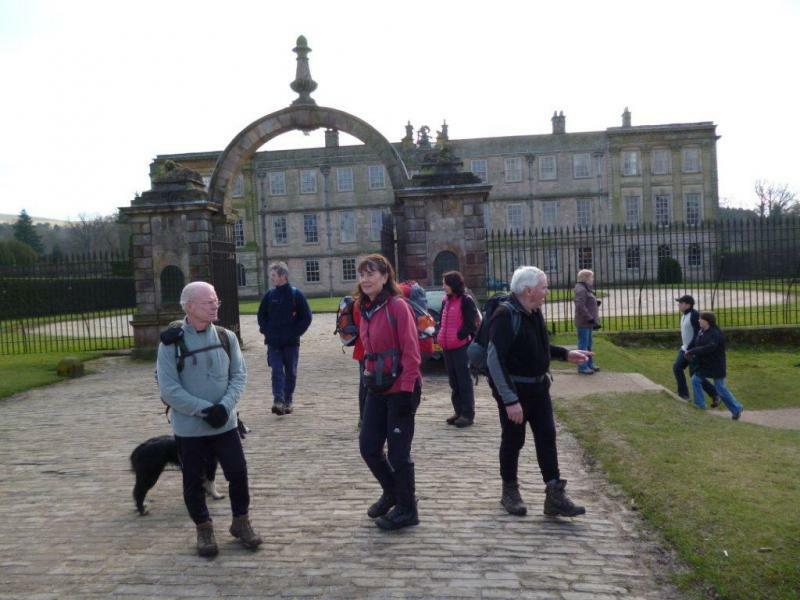 Sadly young Hannah was very soon struggling with blisters and despite the expert ministrations of Kath Page and Jan Baddeley it was clear that the plucky young lady would not be able to continue. Despite her pleas to the contrary we had to arrange for her dropping out. John P took her home and the leadership role fell to myself (John Bullen). With a little help and understanding from everyone we managed fine. 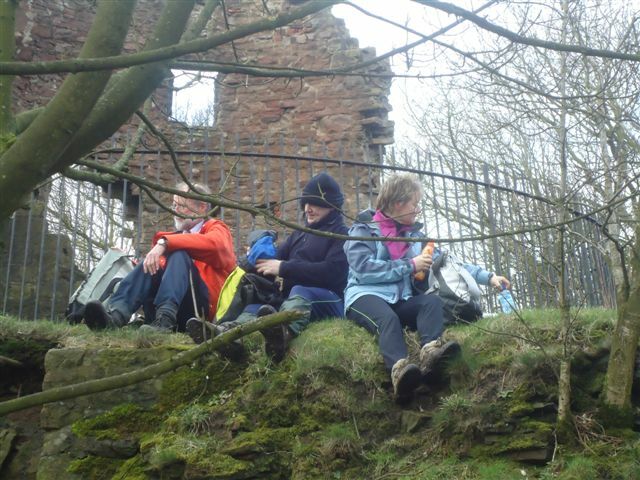 The ruin of the old windmill on Horrocks Hill was the venue for our lunch stop and it being a fine day we had superb views out all across the Lancashire plain from Liverpool Bay in the south to Morecambe Bay in the north. For the second time in the day it took a horse whip to get everyone moving again! Thankfully the weather stayed fine for us as we headed off to cross over the busy M6 just north of Standish. 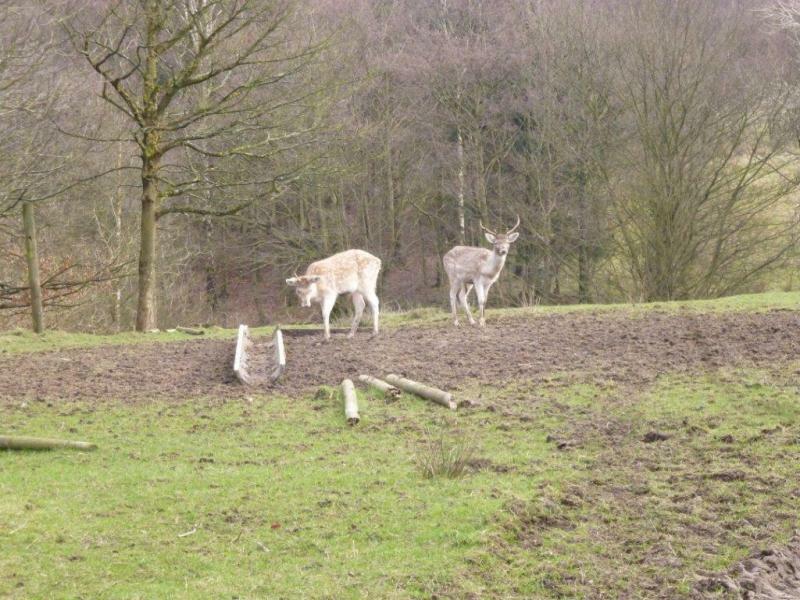 Eagle-eyed as ever, Viv spotted four deer in a little copse staring out at us. John P was making a valiant effort to rejoin the walk but he was behind us. A “fiendish little plan” was concocted to get back to his house before he caught us up and just as he walked through the front door for one of us to eat the last biscuit!!! Suffice to say decency won the day and we waited for him to lead us into Adlington and the finish. 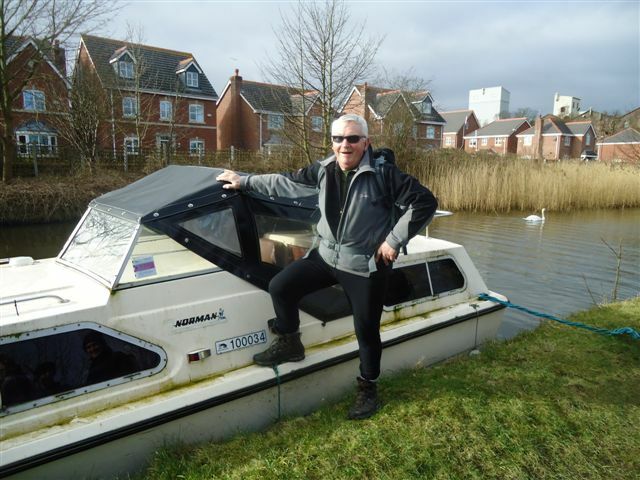 Well done John P – another lovely walk and Good Luck and thanks for their company to Rebecca and Tracy!!!! Sunday February 19th. The Face in the Rock. 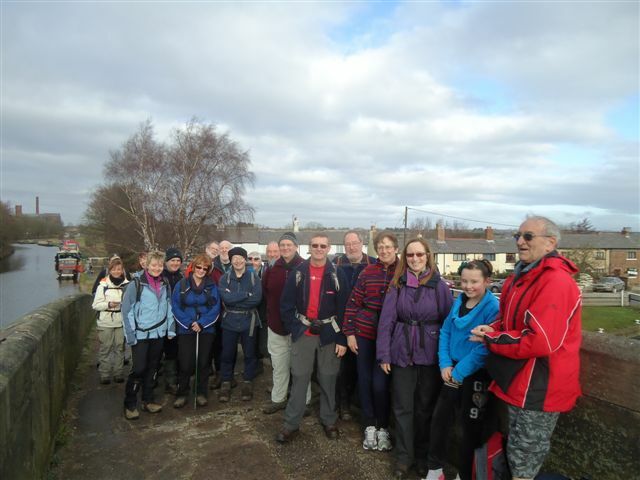 Twenty six humans and 7 dogs left Foulridge Wharf under a clear blue sky for the first Face in the Rock walk. 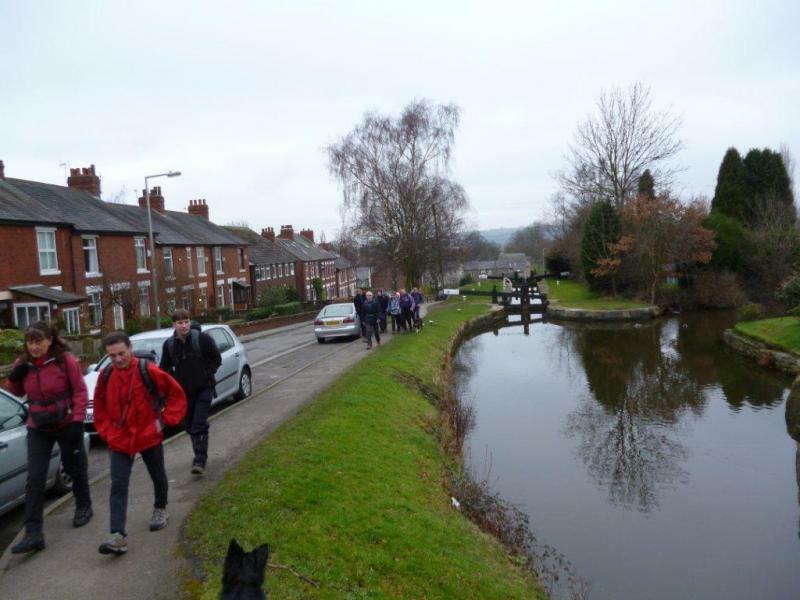 The wharf is close to one end of the “mile tunnel” which takes the Leeds & Liverpool canal under the hills. After passing close (but not too close) to a farm reputed to be one of the most haunted buildings in the country, we arrived at the other end of the “mile tunnel” and I told the story of Bluebell the cow and her adventure. 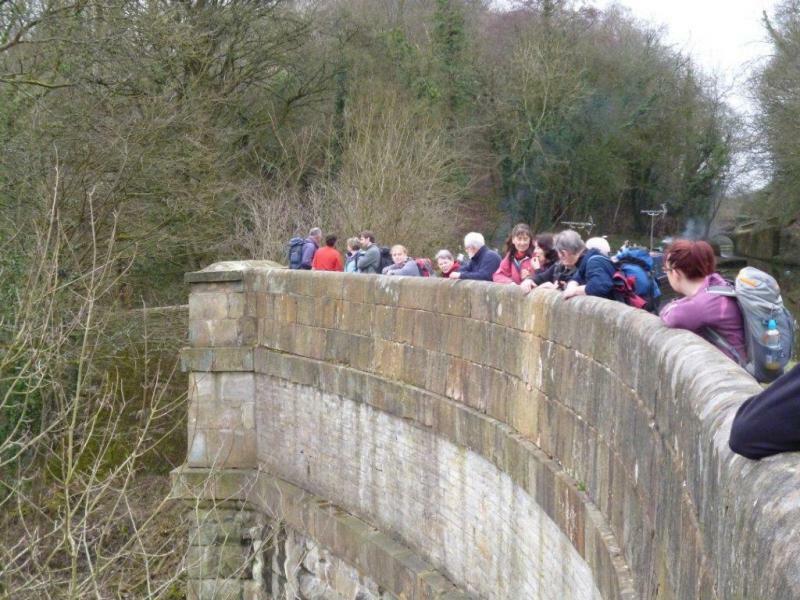 We left the canal at Barrowford Reservoir and made our way into Barrowford to see a bridge where John Wesley, the founder of the Methodist church was mobbed by a hostile crowd. Now we began to gain some height, and soon we were on the moors and looking down on the farm where John and Alice Nutter the infamous witch lived. Our late morning coffee stop was taken in a quarry where Demdike, another infamous witch, was said to have met the devil, but most of the walkers were more interested in finding the face carved into the rock which gave the walk it’s name. Anne Oliver was the first to find it. However the bird spotters amongst the group were enthralled by a pair of peregrine falcons which we were lucky to see at close range. 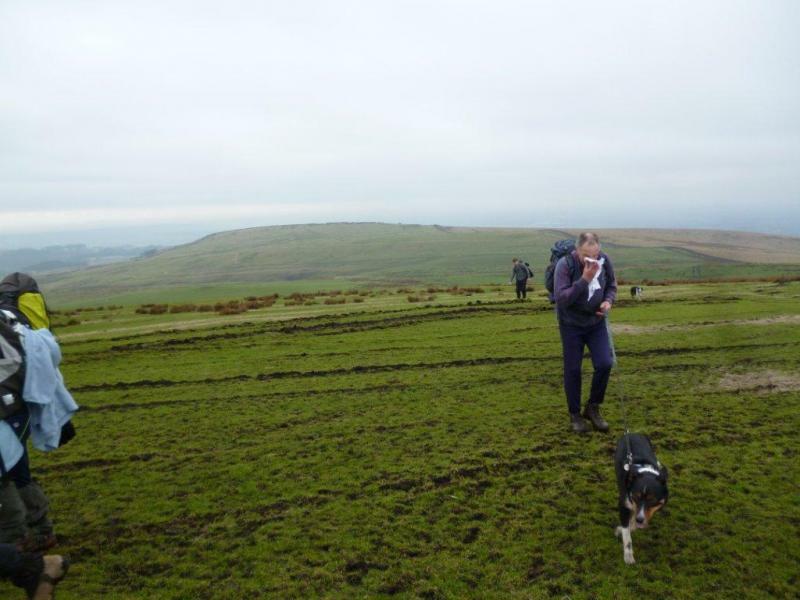 After lunch in Barley, we headed towards Pendle Hill. I think a few of the walkers thought we were going to the top but were secretly relieved when we turned off the main path on the lower slopes. 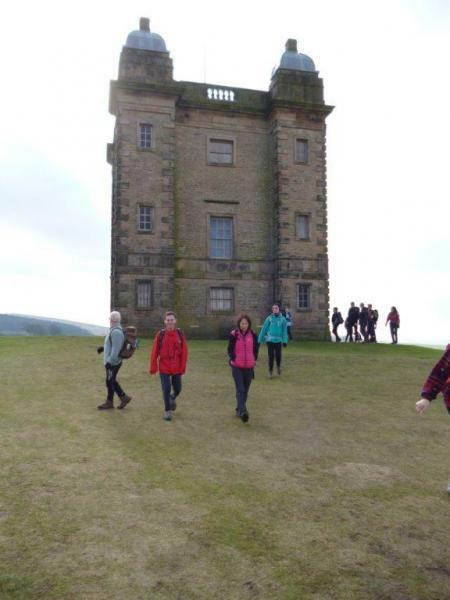 On our return to Foulridge, we passed close to Blacko or Stansfield Tower, a folly built by John Stansfield. The sun shone all day giving us superb all-round views and was still shining as we finished. 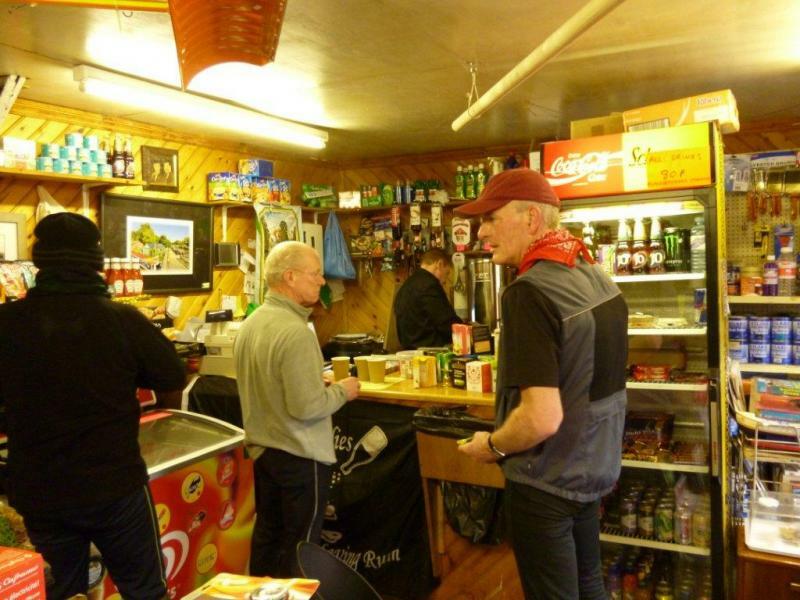 Some of us enjoyed a refreshing drink in the café before heading home. Thank you to Andy for some of the above pictures. For a rescheduled walk we have to say that 21 attendees is highly pleasing and how rewarded we all were for making the effort. The eagle-eyed amongst you may just be asking why does this walk have three leaders listed? Well, having done the recce with Norman I think I can explain. Let’s just say the practice run was four miles longer than the guide books would have you believe and six miles longer than the route we did on the day! The walk was a pleasing surprise package of last year’s schedule which is why we were requested to put it on again and so it proved on rerun. 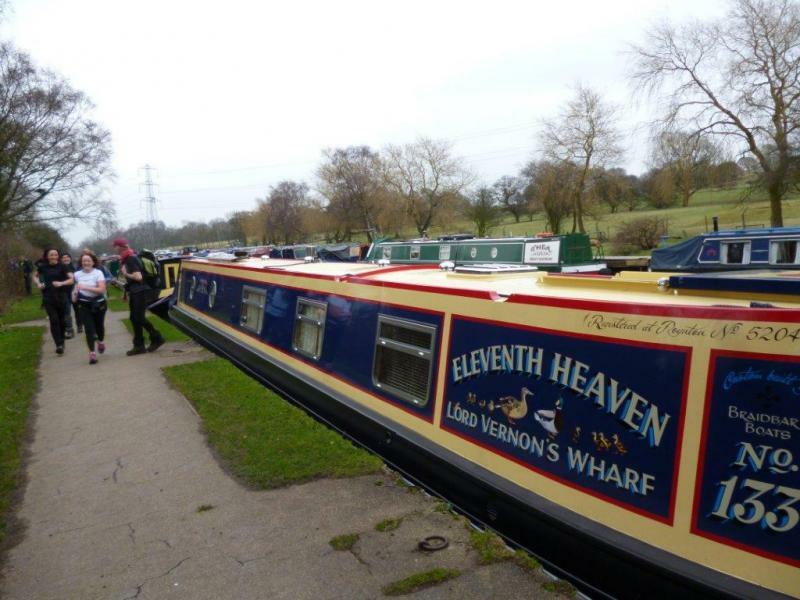 After the quite amazing Marple lock system on the canal we were off on a lengthy towpath trek but just as it began to pall we had a morning stop at a canalside café. Above the counter was the amusing declaration “This café is under Seagull Management. The boss flies in, squawks, ***** on everyone, squawks and flies off again!” I am sure many of us can relate to that. 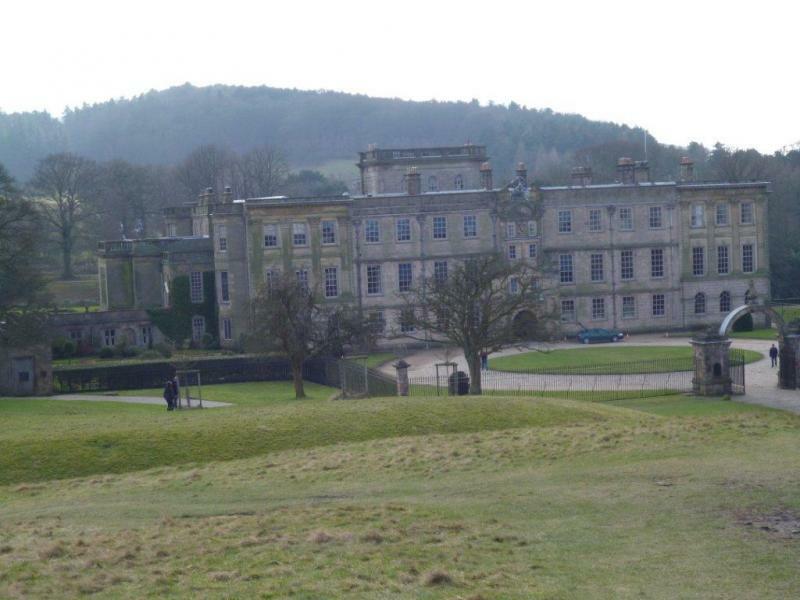 Pretty soon we were treated to the sight of half a dozen deer grazing in front of Windlehurst Hall. 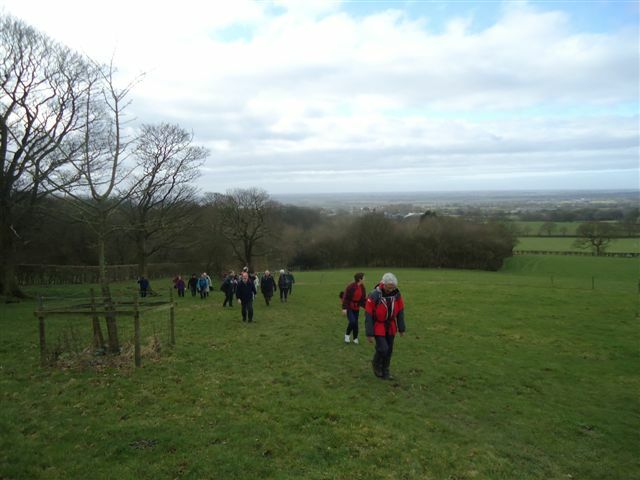 Off we went to Bowstones with its wonderful views out across five counties – Derbyshire, Cheshire, Shropshire, Lancashire and Cumbria. After such a treat we were ready for lunch, taken in the grounds of Lyme Park, which was busy as the sunshine had enticed people out of doors. The afternoon was even more interesting than the morning as we headed down through Disley and alongside then over the River Goyt to Roman Lakes with its peacocks, geese, ducks and café!. 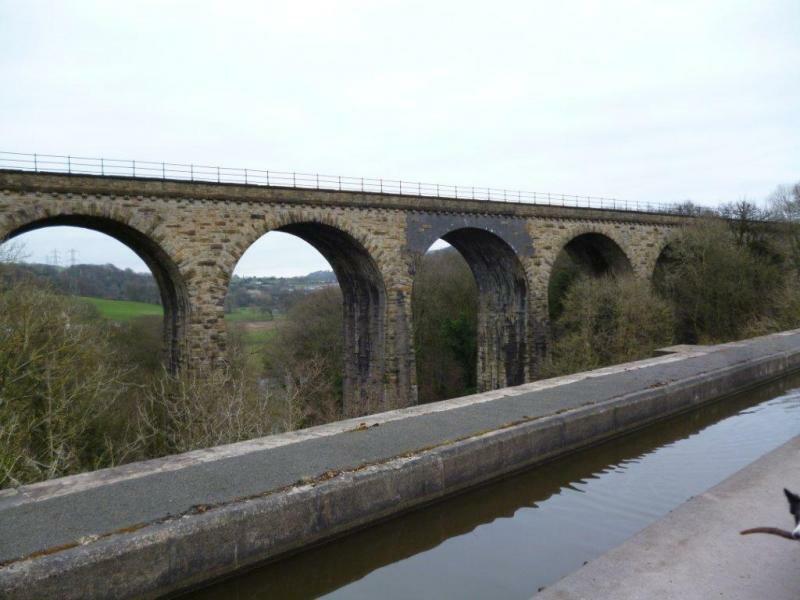 To finish we had the majestic Marple canal aqueduct and, running parallel but slightly higher, the amazing railway viaduct. We could only marvel at such feats of engineering and construction. Ever the joker Norman had Subway Sue lead us in for the last mile and what promise she showed as a future walk leader! Debutant Margaret Oliver’s smile was as wide as the aqueduct when we finished and she said she had certainly enjoyed her day and how good it was to see Chris Greene out with us. Thank you to Howard for the above pictures. Hoping to Bump into the Queen. Wednesday February 29th. Leader: John Plumb. 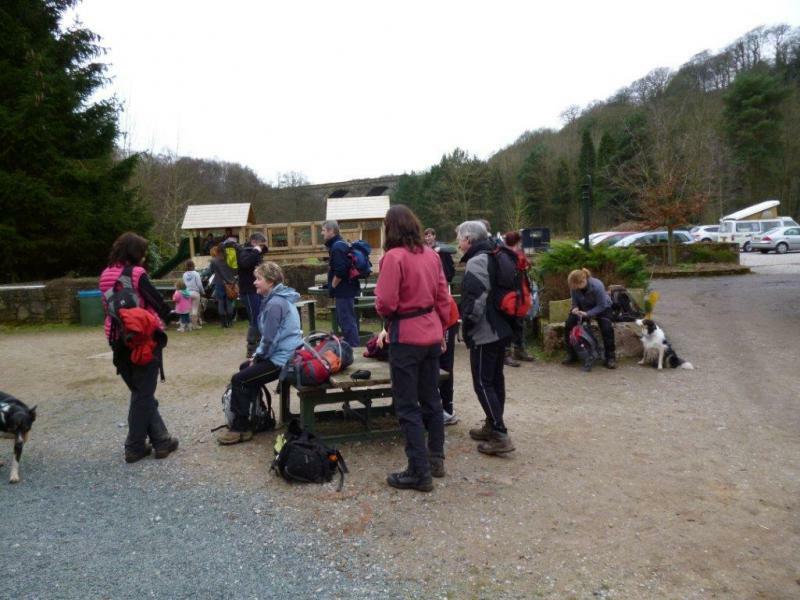 20 walkers and 3 dogs. Maude was joined with two other k9 friends, Meeka and Basil bush! Bum bum! 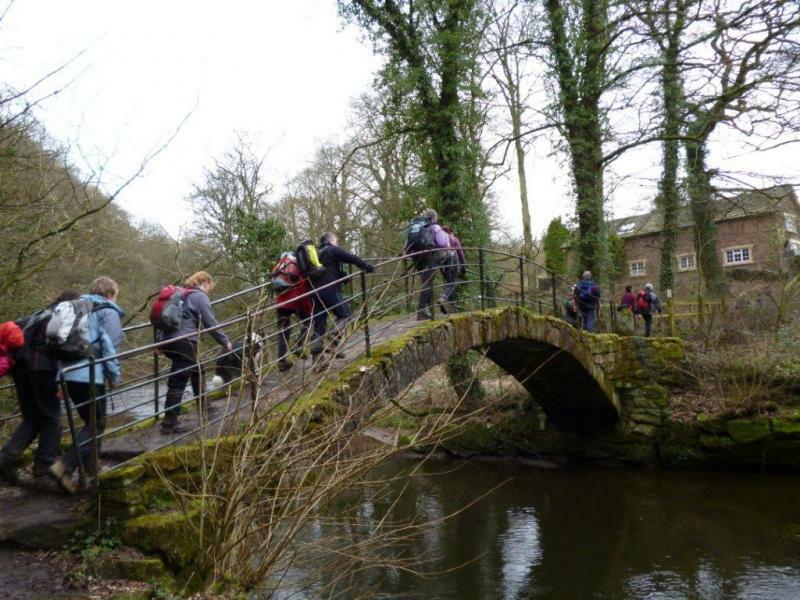 Also joining the walk to explore the beautiful forest of bowland in Hoping to bump into the Queen! were 20 mixed gender long distance walkers. 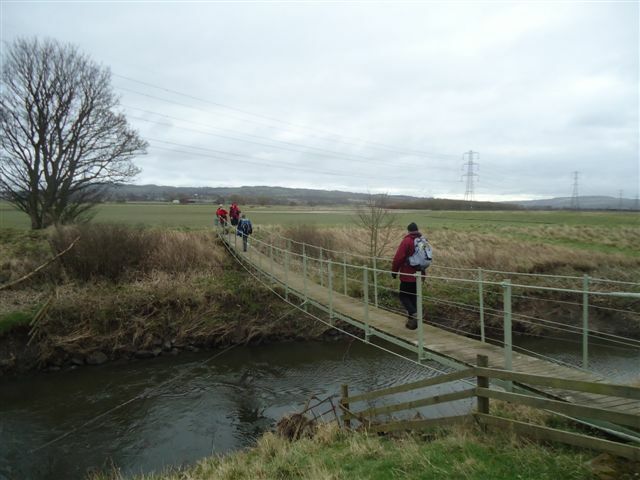 We set off from Dunsop bridge in the Ribble Valley, which according to the Ordnance Survey is the nearest village to the centre of the British Isles. Also BT put its 100,000 phone box there to mark the achievement in 1992. We set of to Beatrix homestead along the tarmac road, then took the path off to the right, up a slight hill onto the soggy fields. Over to the farm at Burnhouse an then carrying on over to the white cottages at Laythams. 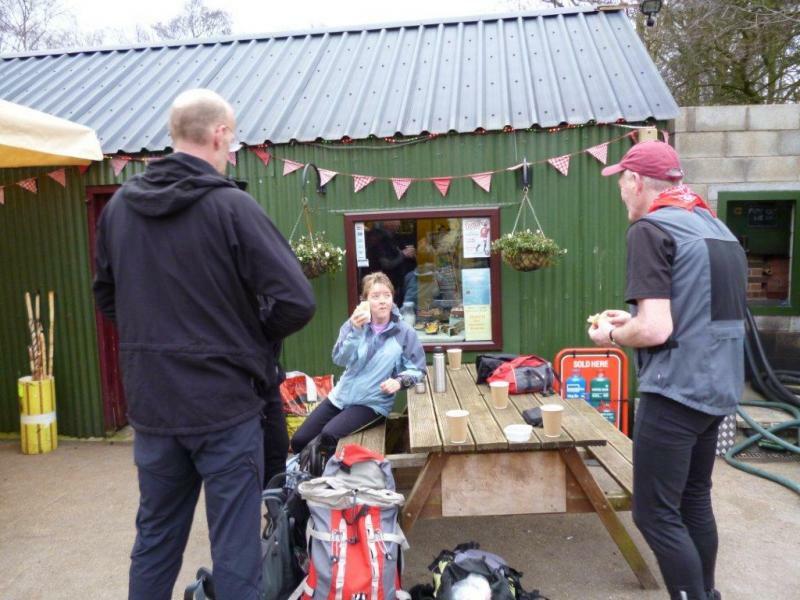 First brew stop was in sight over at Parrockhead farm. First we had to cross farm land which had days old lambs in them, - awwwww. After our 11`s at 11-45 we set off on a detour to the craft centre at Myttons, proved very pleasant. Not stopping we carried on, over yet more stiles to the Crossdale brook, which we followed down stream, to the nicest village in Lancashire; Slaidburn. Here was an obviously super place to linger for lunch, on the green overlooking the river Hodder. Lunch over and playing on the park! (Peter on the swings!) We set off following the river over to Newton. 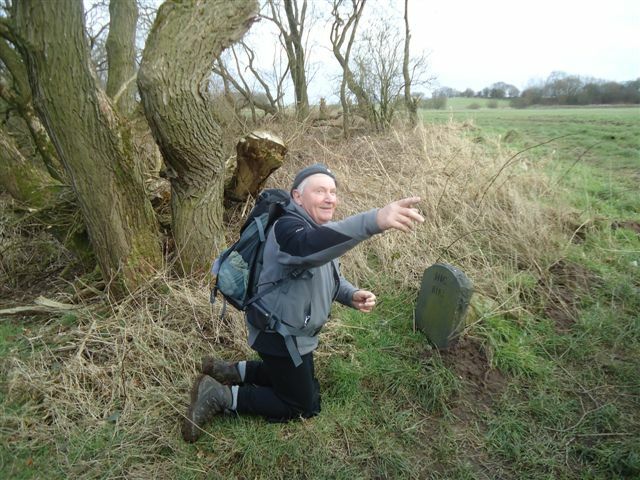 I did yet another detour and took a wrong path which Hilary found very funny because Peter turned my map the right way round, and thus this became a joke for the remainder of the walk. At Newton it was time for an afternoon brew stop, taken on the luxury benches, in the beautiful Village. 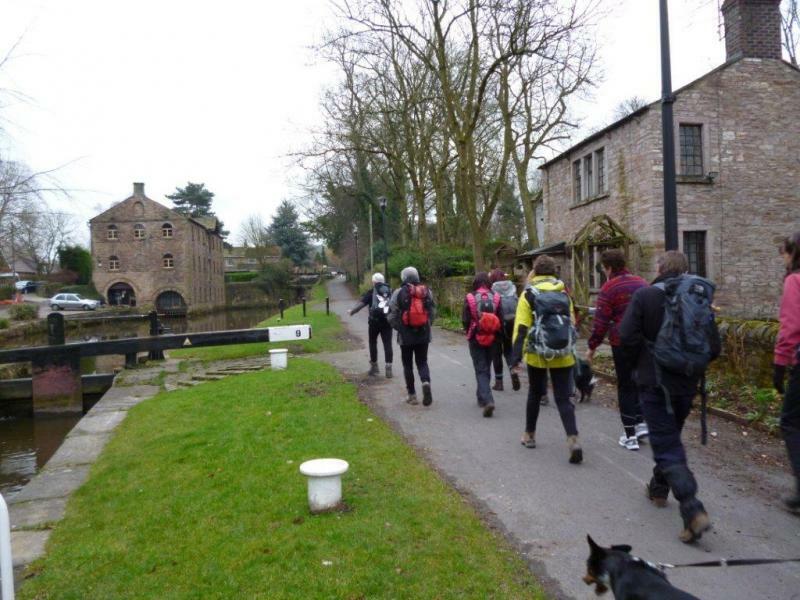 Setting off on our last two miles ramble to Dunsop. Hilary kept on asking "When are we going to see the Queen?" Someone said look at a £20 note, lol, but I did promise she would see two OTTERS. So off we went on the last leg of journey to Dunsop. 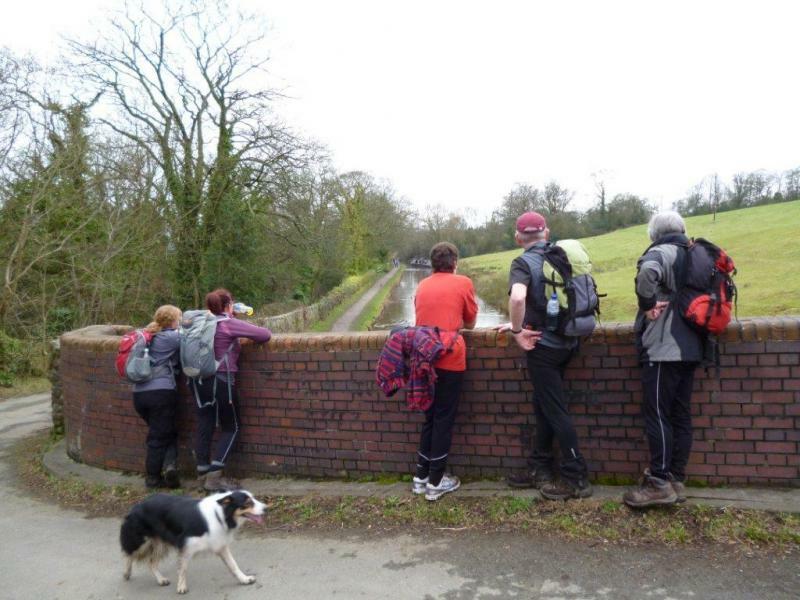 Following the river again, passing Knowimere manor ( thanks to fireman John for the information) after which a few brave walkers went in front of the leader and because the walk was so good they went the wrong way! ( at least I had a map). Over the last bog and past the old health farm were Otters ( stone ones) are in the grounds. Returned to carpark at 3.10pm Distance 10.9 miles. 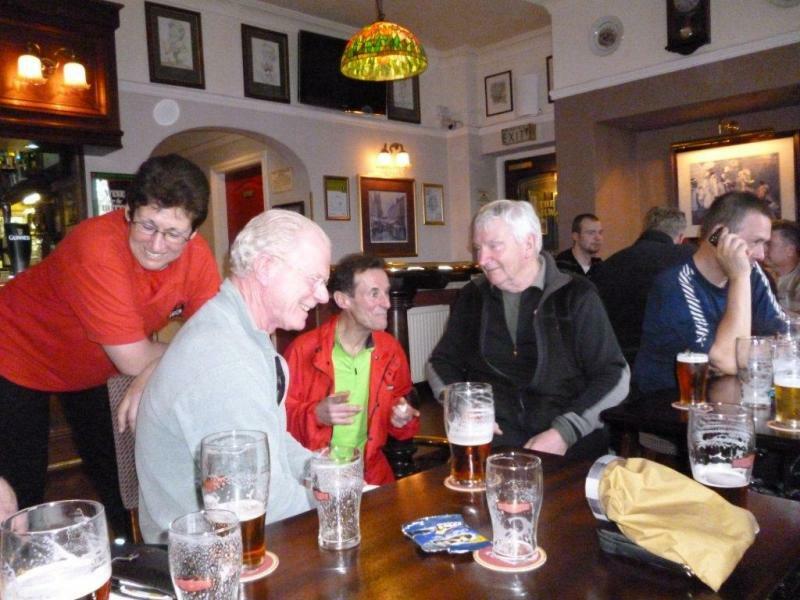 Most retired to the Parkers Arms pub in Newton afterwards for welcome beverages. I wish to thank everyone who made this a very memorable walk with high spirits. I know I lost points because of the mud, stiles, and wrong path and I know not seeing the Queen. 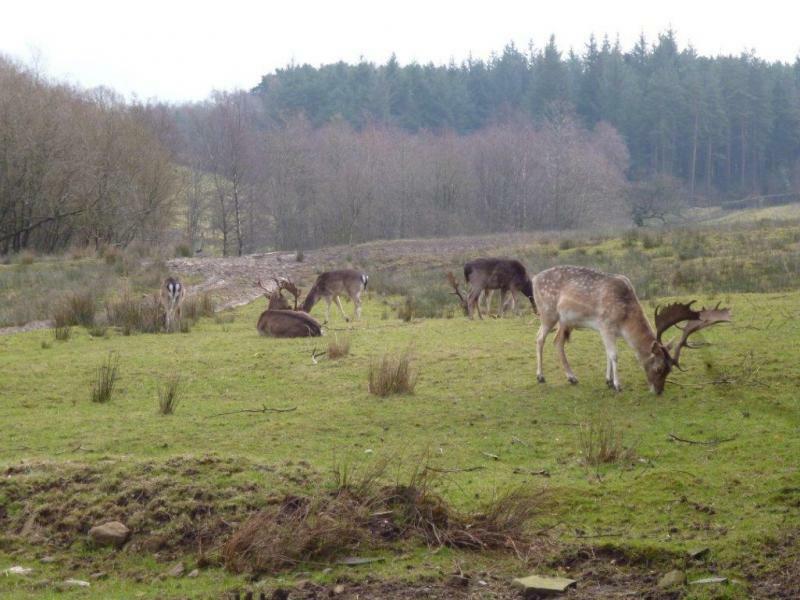 But I think I more than made up for it, with all the wild life and the beautiful scenery of the Forest of Bowland and Hodder valley. Also thanks to Maude, Meeka and Basil brush bum bum….